The new Workcoeman property was situated just south of the New Hartford-Barkhamsted town line, at the end of an old logging road. During the nineteenth century, the land was primarily used as a wood lot, supplying timber for the barns and fences of local farms. Around the turn of the twentieth century, the trees were cut for charcoal, to feed the forges of Connecticut’s metallurgical industries. After loggers felled the trees, they dragged them to a charcoal hearth where the wood was covered with layers of leaves and earth. Colliers lit the buried wood and tended the fire, letting in just enough air to boil off the water and burn off the tar and volatile oils. In about two weeks, the colliers produced a nearly pure carbon fuel. The long burning fires sterilized the earth, which prevented new plant growth. These charcoal hearths were some of the few open places at Workcoeman in 1924. One collier’s hearth, not too far from the edge of the water, was the site of early council fires, and several incarnations later is the present amphitheater. After a few decades of recovery, the land was densely forested with thin white birches and American beeches. Countless shoots grew out of the old red oak stumps; some survived and grew into trees with as many as seven trunks. Many of these long-lived trees are still growing; some of the most distinctive provide the canopy over the camp road. The hardy rootstock of the American chestnut also allowed for quick regrowth; however, the chestnut blight reached Northwest Connecticut in the 1910s, leaving many small, dead, standing trees by 1924. In the moister sections of camp, yellow poplars were the dominate succession species, with a few growing as large as the hemlocks. Eastern hemlocks produce terrible charcoal and, therefore, were rarely cut; left alone by the loggers, the trees towered over the hardwood saplings in the early years of camp. The lake itself attracted settlers who built mills along the outlet early in the nineteenth century. The Greenwoods Scythe Company purchased the water rights to the pond, and their successor companies built a permanent stone dam at the outlet of the lake in 1876. This dam provided water power to the mills in New Hartford Center during the dry summer months. 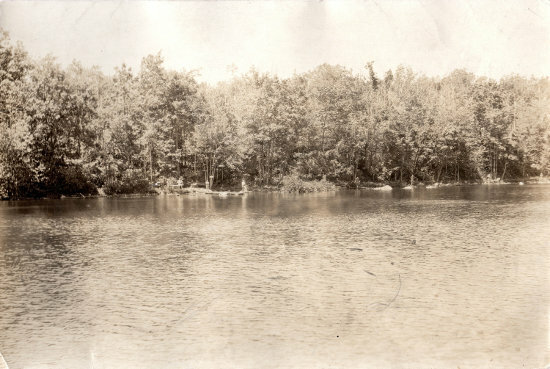 The high water quality of the spring fed pond also brought the attention of the New Britain Water Department, which considered West Hill Pond as a potential reservoir in the 1910s. However, recreation beat out the other potential uses. As early as 1880, the pond attracted picnickers and vacationers, and in the early 1920s, Frederick Baldwin subdivided much of the lakefront property for summer cottages. Seeing the opportunity for a Scout camp, Frank Coe purchased the five northern most lots just before his death in 1924. The Dautrich Studio photograph below shows the Camp Workcoeman shoreline in 1924.